We are a work hard, play harder type of family. I love bringing family and friends 2gether to share in the experience of birthday parties, Christmas parties, Supper Clubs, etc. Not only will I share my party planning tips and decorating ideas, I’ll also share some playtime and learning time activities we do 2gether. One of our favorite vacation spots is Acadia National Park, which is 3 ½ hours away. I wanted to make the car ride as fun and relaxing as possible and prevent the restless kiddo meltdowns. My first stop was the dollar store. I picked up 3-4 things per kiddo for the road trip, like workbooks, travel games, Disney themed coloring pages and crayons. I wrapped each gift with their favorite color tissue paper and saved them for rewards for good behavior to have throughout the car ride. I found this great idea on Pintrest from Less than Perfect; Life of Bliss, Kids Clips for Road Trips. I didn’t have a lot of time to prepare so I tweaked it a bit. 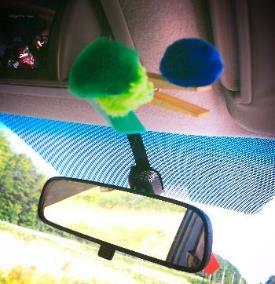 I took 2 clothespins and glued the boys’ favorite color pom-pom on them. Jackson’s clothespin was green and Nolan’s was blue. The clothespins were on one side of the passenger’s side visor and if they behaved from one stop to the next the pins would not move. If they didn’t behave it would get moved. If it didn’t move to the other side of the visor, they would get a reward, treat or a new game. The treat was gum or an M&M. The rewards were the gifts that I bought from the dollar store. The games included, ISpy, a travel bingo that I printed out, I’m thinking of an animal and the color game. The color game was created because I wanted to have a game that my 3 yr. old would enjoy. So, when we were at Home Depot a few weeks before, we went by all the paint color swatches and I grabbed 2 swatches of each primary color. I put those in an envelope with their name on it. When they received their envelope, they took out the paint swatches and had to call out the things they saw in a specific color. For example, if Nolan saw a car or sign, he had to yell out, “RED car” or “BLUE sign.” Once they called out the correct color they handed me the swatch. When the swatches were running out, they would help each other find the last of the remaining colors. The end result was a team effort! Don’t get me wrong; we had our movies as well. But as you know, even a 3-hour car ride needs a little more than just movies. All and all these small things that cost less than $10 were a huge hit and worked throughout the vacation week. To be honest, it was kind of nice to have all that time 2gether and play 2gether in the car. 2gether is about nurturing greater connectivity and chemistry amongst family and friends as We EAT, We LIVE and We PLAY. I believe we're all better 2gether.